Sen. Elizabeth Warren, D-Massachusetts, speaks during an organizing event at Curate event space in Des Moines, Iowa, Saturday, Jan. 5, 2019. On Sunday night, President Donald Trump used that same massacre as a punchline in his latest broadside against Sen. Elizabeth Warren, D-Massachusetts, the Democratic presidential hopeful whom he regularly calls “Pocahontas” in jeering reference to her claims of American Indian heritage. Trump’s tweet came amid another extraordinary late-night Twitter barrage as the president – battered by public blame for the ongoing government shutdown and new bombshells about his links to Russia – also lashed out at Post owner Jeff Bezos and quoted from a racially charged immigration column by Pat Buchanan. His attack on Warren, who officially jumped into the 2020 presidential race last month, drew perhaps the biggest reaction online thanks to its invocation of a particularly disgraceful chapter of American history. In late 1890, 470 U.S. soldiers intercepted a group of Chief Big Foot’s Sioux, who had been heading south across the plains toward a refuge, according to an account by Mark Hirsch, a historian at the Smithsonian’s National Museum of the American Indian. The soldiers led the Sioux, who had 106 warriors and roughly 250 women and children, to a camp at Wounded Knee Creek in South Dakota. When the U.S. commander, Col. James W. Forsyth, ordered Big Foot’s people to surrender their weapons on Dec. 29, 1890, shooting suddenly erupted and the soldiers surrounding the camp began indiscriminately gunning down the Native Americans. Trump has already faced backlash for his use of “Pocahontas” to describe Warren, particularly after he unleashed the taunt at a November 2017 event honoring Navajo code talkers. 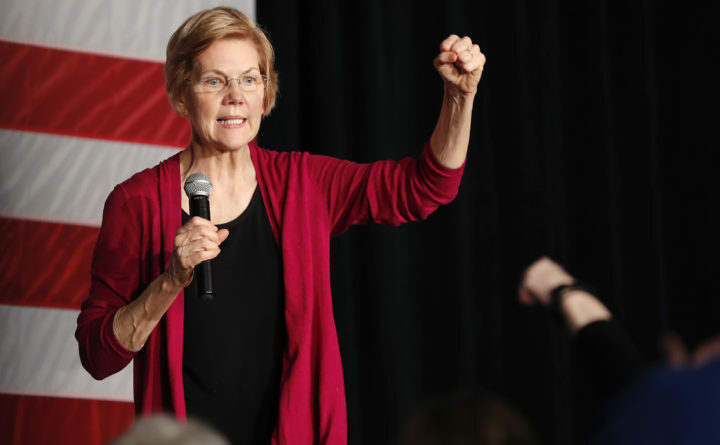 In October, Warren released the result of a DNA test showing that she did have Native American ancestors a number of generations ago – a result that only egged the president on and also drew criticisms from the Cherokee Nation and others. Trump and his administration have accused Warren of unfairly benefiting from her claims of Native American heritage while she was a professor at Harvard, an allegation fact-checkers have debunked. For many critics, Trump’s use of the mass killing at Wounded Knee – along with his reference to the Battle of the Little Bighorn, where hundreds of U.S. soldiers and American Indians died in Gen. George Armstrong Custer’s infamous last stand in 1876 — took his Warren attacks to a new level. “When the extent of your criminality is so transparent that your only defense is deflection through racist offensive, it is seriously time for you to leave,” tweeted Honor Sachs, an assistant professor of history at the University of Colorado at Boulder who has written for The Washington Post about the history of the Pocahontas story being used by white supremacists. That wasn’t Trump’s only late-night tweet on Sunday that drew notice for its racial overtones. Shortly after his Wounded Knee messages, Trump posted two tweets quoting from a Pat Buchanan column to support his push for a wall on the southern border. “The only way to greater ‘diversity,’ the golden calf of the Democratic Party, is to increase the number of women, African-Americans, Asians and Hispanics, and thereby reduce the number of white men,” Buchanan writes in the column. Trump’s string of Sunday night tweets came at the end of a bruising weekend inside a snowed-in White House. After the New York Times broke news that the FBI had launched an inquiry into whether the president was covertly working on behalf of Moscow, The Post’s Greg Miller reported that Trump had gone to “extraordinary lengths” to keep his conversations with Russian President Vladimir Putin secret, even from top administration officials. A Washington Post/ABC poll on Sunday found that 53 percent of Americans mainly blame Trump and the GOP for the ongoing government shutdown, with 29 percent blaming congressional Democrats.